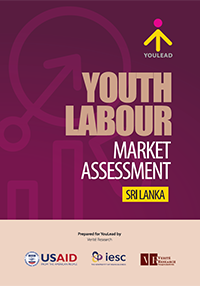 The Youth Labour Market Assessment takes an in-depth look at youth employment and unemployment in Sri Lanka. This report examines 4 gaps; skills gap, aspirations gap, information gap and the structural gap, which are used to explain the paradox of high youth unemployment in a country which has a large number of job opportunities available presently. Bridging these gaps, especially in the high growth sectors in Sri Lanka is a priority for policymakers. Analysis from a primary survey of 2,000 youth and 211 employers are the main data source for the report. The report provides detailed insights on unemployed youth, constrained youth, employed youth, gender and entrepreneurship training. An abridged version of the full report is also made available, and provides key findings and recommendations that are pertinent to the private sector, donor community and vocational training providers. The report was produced for YouLead, a USAID-funded youth employability and business startup programme working to improve youth employability outcomes by addressing bottlenecks in the technical and vocational education and training sector in Sri Lanka.